Another great side that you can't go wrong with! Didn't have any marjoram so checked online as to which herb I could sub - and the lucky herb was OREGANO. To make clean-up easier, I lined the baking sheet with foil and sprayed with nonstick cooking spray. 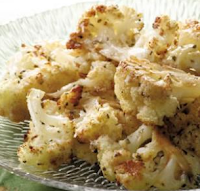 *Their tip on preparing florets from a whole head of cauliflower really worked: "Remove outer leaves. Slice off the thick stem. With the head upside down and holding the knife at a 45º angle, slice into the smaller steams with a circular motion - removing a "plug" from the center of the head. Break or cut the florets into the desired size." Talk about a tasty and healthy way to enjoy cauliflower!